When the cursor is inside of a string declaration and you press ctrl Y the whole string will be selected. This function is currently limited to the case when the string is only in one line. 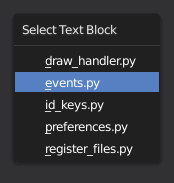 I extended the right click menu in the text editor to enable you to comment the selected code lines out more quickly. You can change the active text block with the ctrl TAB shortcut more quickly now. It opens a small menu with all the text blocks that are currently inside the file. This operator can be found in the Format menu. It does the same as Convert to Spaces/to Tabs but it chooses what to do automatically based on the Tabs as Spaces property in the Properties panel.